I always lose a few hours a week looking for mobile home decorating ideas and neat living room mobile home makeover ideas online. I’m noticing that larger websites like Better Homes & Gardens are starting to give mobile homes some attention finally! How cool is that? Living simple and within your means is trendy now but all of us mobile home owners knew that all along! Mobile homes will always be the first tiny homes. 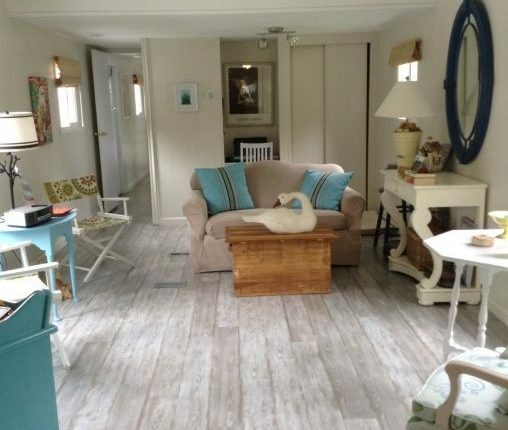 Anyway, here are 5 great living room mobile home makeover ideas for you! Single wides usually have awkward entry ways. You open the door and boom, you’re in the living room and there’s no where to put your shoes and jackets. This screen door divided fixes that by creating a space just for the entryway. 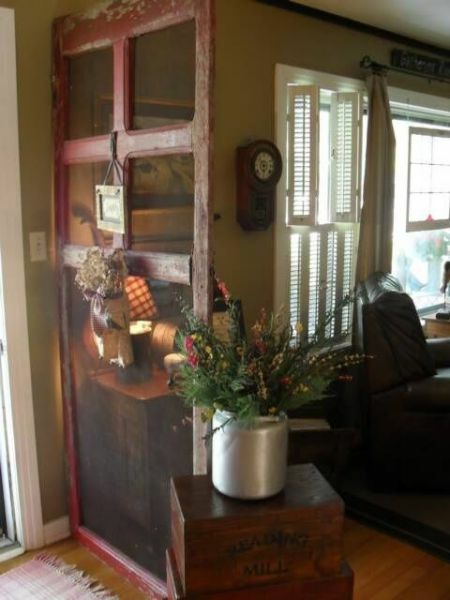 We love this cool idea to help separate the living room from the front door entrance. Think outside the box to make your home unique. Related: See our flooring options for mobile homes here. This California double wide definitely has a wow factor! They created a partition wall with a see-thru fireplace between the living room and kitchen. The home is featured on BHG here. Related: See Jenny’s Fleetwood Double Wide Remodel for more inspiration. Leonardo knew his stuff! 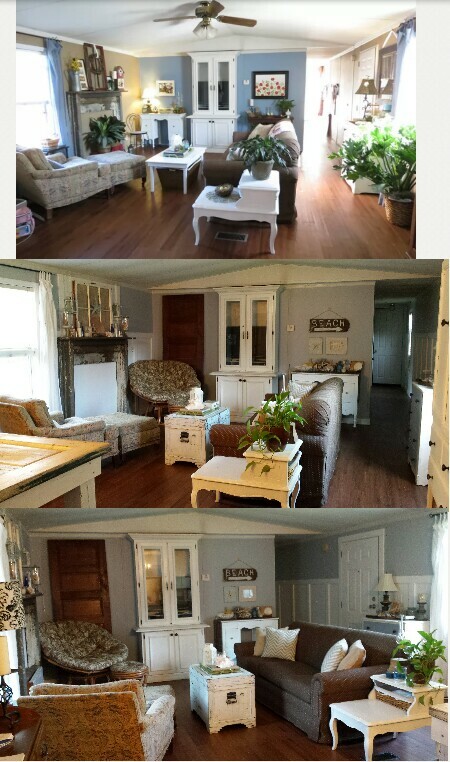 Simplicity is the ultimate form of beauty and sophistication and this single wide living room makeover proves it. The muted palette allows that gray floor to be the center of attention. We found this on Pinterest here. This mobile home living room is GORGEOUS! 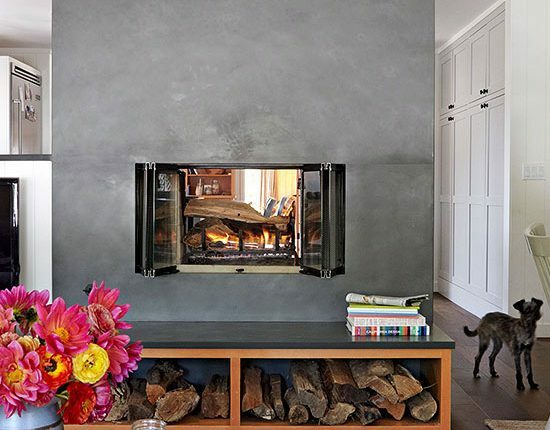 Changing the fireplace facade changes the entire look of a living room. This room was a project featured on the short-lived show called Mobile Home Disasters. 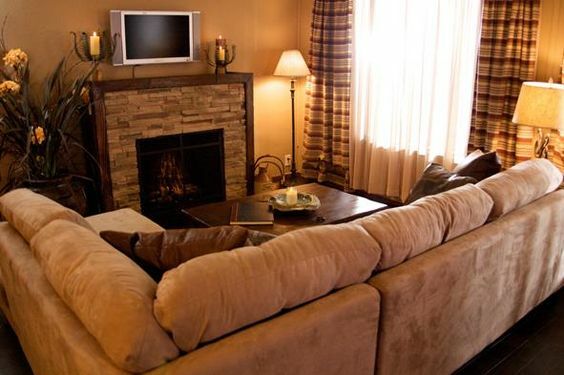 The stone fireplace surround updated the entire room. You can see 25 Great Mobile Home Room Ideas here. These are just a few of the many living room mobile home makeover ideas we’ve found online lately. There are so many ideas out there, the possibilities are endless. We’ll keep doing our best to share them with you. I so wish that the #2 home would have a blog so that we can see it more closely and anything else in this beautiful home! I wish there were a lot more blogs for mobile homes, too! Thanks for reading! Hey Crystal, thanks for this site. It gives me hope for the future of my aging mobile home that I can re-model it into a dream one I will be more than comfortable in. I have a question for you, a couple of years ago I remember reading a post to you from someone that wanted to contact you about doing a tv show, whatever happened to that? Are you still in the stages of getting it going, I think it would be amazing to have a decent mobile home remodel and help show out there. I have been contacted by 3 or 4 different people about doing a show! Unfortunately, my idea of a mobile home remodeling show was way off from theirs. I was so afraid that they would demean the homes and make people living in them appear to be rednecks or something silly. I really have a big trust issue when it comes to Hollywood. I keep seeing well-made shows about campers and tiny homes so I think there is hope! Thank you, Janice. It means a lot to me to read comments like yours. Thank you! !